There are many branches of the Franciscan family. Among the male communities are the OFM Conventual Franciscans, OFM Capuchin Franciscans and OFM Franciscans. “OFM” stands for “Order of Friars Minor” or “Order of Lesser Brothers” as St. Francis himself wanted his followers to think of themselves as being a. )relational and b. )at the service of other people. Today is the Feast Day of a Conventual Franciscan who was at a Nazi death camp when a young Jewish father was selected to be killed. 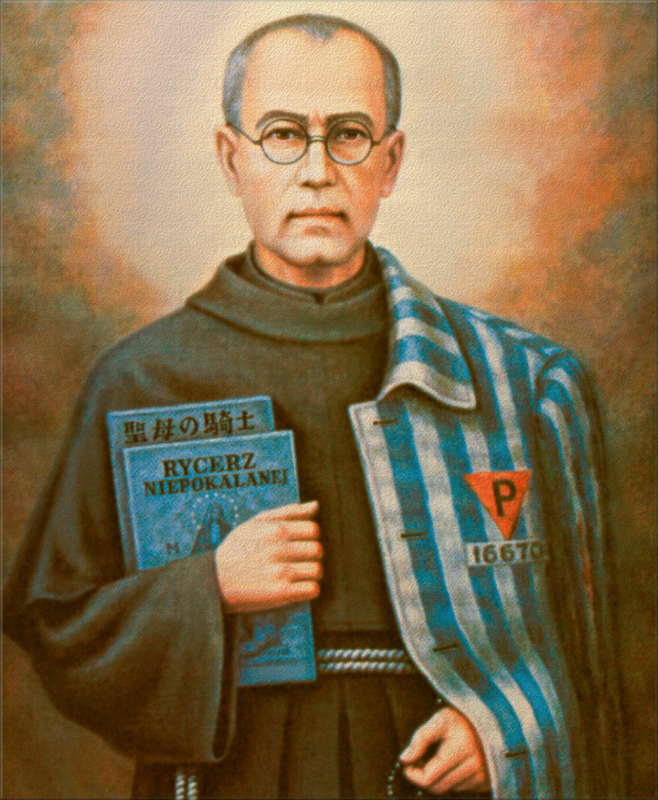 The friar, Maximilian Kolbe, presented himself as a substitute for the man. He was killed; the other man lived. Happy Feast Day of the Conventual Franciscan Martyr St. Maximilian Mary Kolbe! St. Maximilian has played a role in my life. One of the older parishioners at my parish of St. Anthony’s growing up was Francis Samsel. He was born of Polish parents in Toledo but they immigrated back to Poland. He entered the Conventual’s at Niepokalanow (City of the Immaculata) near Warsaw. St. Maximilian told Francis to leave and flee back to the USA before the Nazi’s took over Poland. Francis left and became a mason and built the old confessionals and perpetual adoration chapel at my parish. May St. Maximilian continue to intercede and protect us like he did for Francis Samsel when he was a teenager. May we be strong enough like Maximilian to choose the two crowns of purity and martyrdom from the hands of the Immaculata!